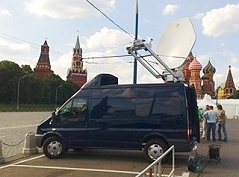 Flycom offers SNG trucks for satellite uplink transmissions in Moscow, Russia. Moscow, April 2016: Flycom - which is new to promoting its facilities on TVZ - is one of the leading providers of mobile satellite transmission services in Russia. Based in Moscow since 2005, it has SNG trucks, OB vans and flyaway antennas. Flycom says it possesses diversified uplink experience in worldwide television broadcasting. Its Outside Broadcast unit, SNG trucks, and flyaway systems have been hired by clients to broadcast major events such as breaking news, conventions, sport events and entertainment from around Russia and CIS, Belorussia, Kazakhstan, Armenia, Azerbaijan, Kyrgyzstan, Georgia, Moldova Europe and worldwide.